The first thing you’ll notice when you arrive at this beautiful boutique is the wonderful sense of peacefulness and calm. This ambience is inspired by the hotel’s name, meaning ‘Harbour of Peace’, bringing a desirable tranquillity to an oasis characterised by its picturesque waterways. 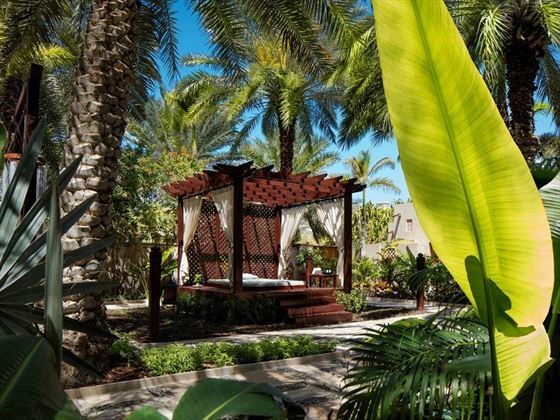 Part of the Madinat Jumeirah resort, this retreat prides itself on its authentic Arabian experiences, and it’s the one we always recommend for a luxurious family getaway. There’s plenty of fun and excitement to be had here, including the impressive kid’s club with over 1,000sqm of play areas and pools for little ones to explore, craft and make friends, as well as a brilliant rooftop pool overlooking the beach. Fancy trying out Dubai’s incredible Wild Wadi Waterpark™? Complimentary access is included in your stay, giving you the chance to enjoy a wet and wild day out with the family. 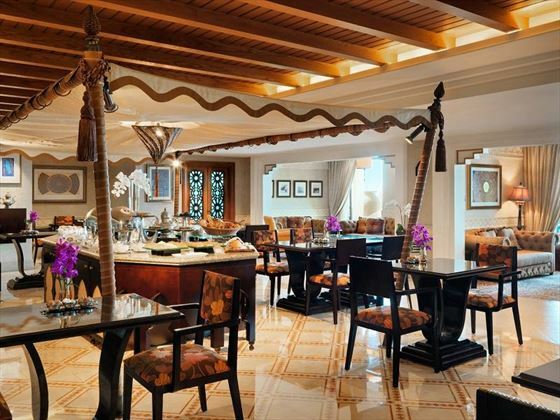 With over 50 deliciously decadent restaurants, bars and lounges to choose from, you’ll dine like royalty every night, and the multitude of flavours and international cuisines means you’ll enjoy a sumptuous foodie journey during your time here. 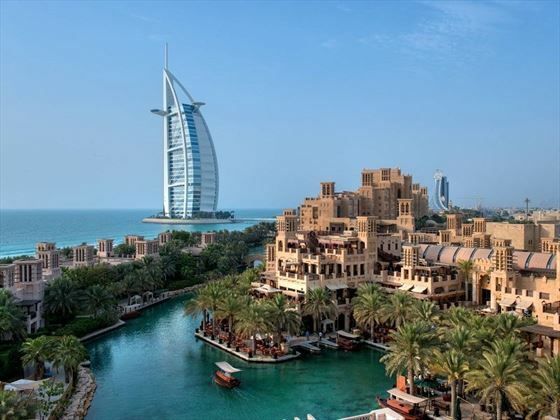 If that wasn’t enough, guests will also have access to the other three hotels’ facilities in the resort, Jumeirah Dar Al Masyaf, Jumeirah Al Qasr, and the newly opened Jumeirah Al Naseem. 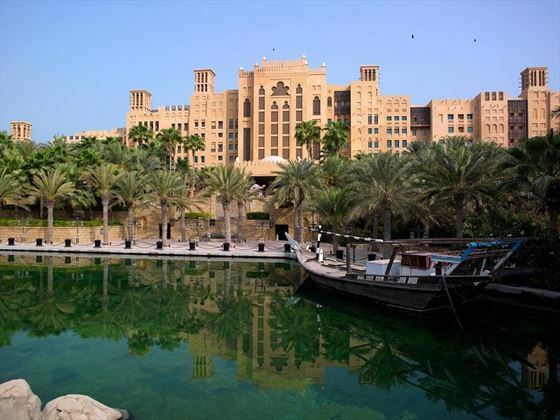 The Mina A’Salam is the heart of the Madinat Jumeirah Resort. 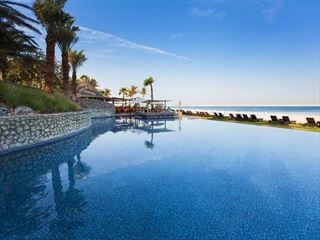 Nestled amongst Dubai’s largest stretch of private beach overlooking the sparkling waters of the Arabian Gulf, this boutique hotel holds a particularly luxurious and tranquil ambience. Lots of impressive shopping centres, eateries and bars are dotted around just steps from your hotel, along with the marvellous Emirates Shopping Mall and Ski Dubai just 8 minutes away. As guests of this resort, you will receive complimentary passes to the nearby Wild Wadi Waterpark™, strongly recommended for a fun day out with aquatic rollercoasters, surfing machines, slides and tunnels. Downtown Dubai is just over 20 minutes away, filled with impressive malls, parks, famous landmarks, zoos and aquariums. Take advantage of the pristine sandy beach on your doorstep with a couple of days full of relaxation and cocktails in the sun. 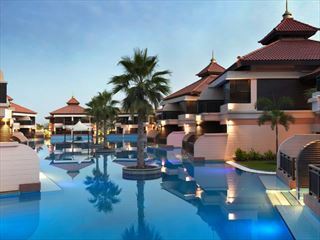 Arabian Standard – Contemporary 50sqm rooms with a limited partial view of Jumeirah Al Naseem. Sleeps three adults, or two adults and two children. 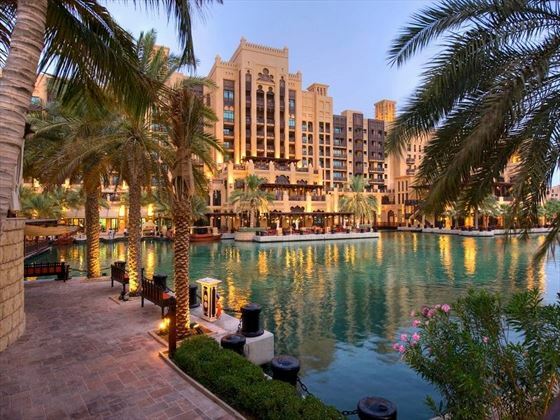 Arabian Deluxe – Spacious 50sqm rooms overlooking Jumeirah Al Naseem, with a lovely scenic balcony. Sleeps three adults, or two adults and two children. Ocean Deluxe – With the same amenities as the Arabian Deluxe, but with pretty views of the ocean and a dressing area. Sleeps three adults, or two adults and two children. 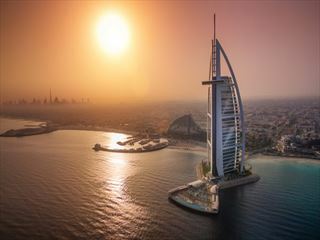 Executive Arabian – Gorgeous 50sqm rooms, featuring a living area and a pretty balcony overlooking either the resort, Burj Al Arab Jumeirah, or Wild Wadi Waterpark™. Guests also receive complimentary breakfast and complimentary airport transfer, as well as Club Executive Lounge and Premium Leisure Club access. Sleeps three adults, or two adults and two children. Executive Ocean – Similar to the Executive Arabian, but with amazing views of the ocean. Sleeps three adults, or two adults and two children. One Bedroom Ocean Suite – Idyllic 115sqm suites overlooking the sparkling ocean, featuring a private balcony, lounge and dining areas, and a marble bathroom. Guests also receive complimentary airport transfer, complimentary breakfast as well as Premium Leisure Club and Club Executive Lounge access. Sleeps three adults, or two adults and two children. One Bedroom Gulf Suite – Opulent 122sqm suites with stunning ocean views, featuring a living and dining area, a balcony, a marble bathroom, and a dressing area. Guests also receive complimentary airport transfer and complimentary breakfast, as well as Club Executive Lounge and Premium Leisure Club access. Sleeps three adults, or two adults and two children. Royal Suite – Indulgent 268sqm suites featuring lavish décor, panoramic garden and ocean views from the balcony, a living area, a study, two bathrooms with a Jacuzzi, and two bedrooms. Guests also receive complimentary airport transfer, complimentary breakfast as well as Club Executive Lounge and Premium Leisure Club access. Sleeps five adults, or four adults and two children. From Italian and Asian cuisine, to decadent fine-dining and seafood dishes, Madinat Jumeirah’s wide variety of over 40 restaurants and bars means you won’t be short of new foods to try. 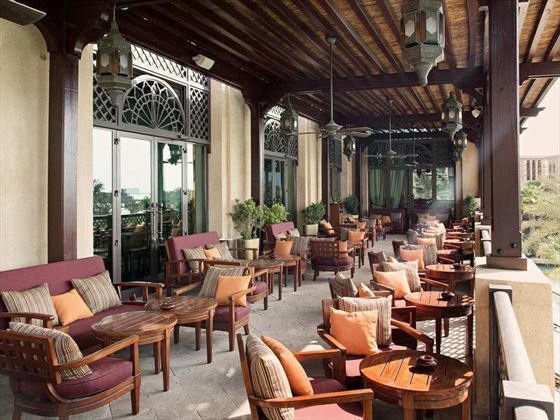 Koubba Bar – One of Dubai’s most lavish bars, perfect for a cocktail whilst watching the sunset. 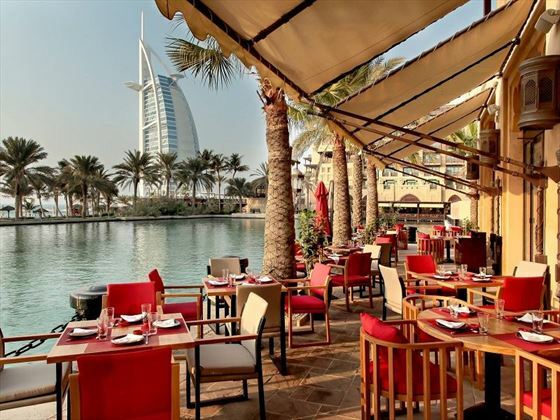 Al Hambra – A traditional Spanish restaurant overlooking the palm-tree adorned canals, with great entertainment and a variety of Spanish dishes. 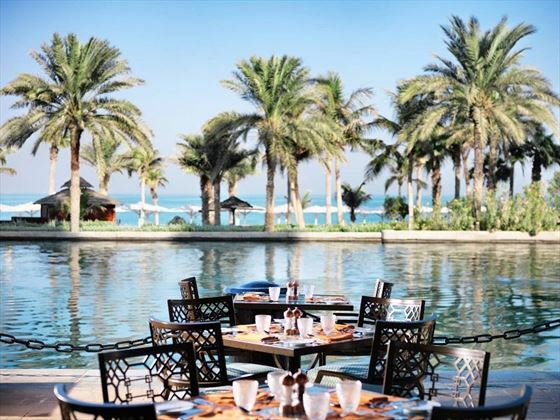 Rockfish – Known as one of Dubai’s most spectacular seafood restaurants – their speciality is raw fish. Shimmers – A delightful, casual Greek restaurant perched on Madinat Jumeirah’s sugary sand beach. Pierchic – A stylish restaurant overlooking the Arabian Gulf, with decadent a la carte menus serving up a mix of sashimi, scallops and lobster. The Hide – Inspired by America’s trendiest urban bars and eateries, the meaty menus here are delicious. Talise Spa – Treat yourself to a treatment catered to your individual needs at this relaxing paradise. Private yoga classes will keep you zen, whilst the steam room will leave you feeling revitalised. The complimentary Sinbad’s Kids Club is a great way to keep the kids entertained, with over 1,000 square metres of play areas and pools, face painting, sports, movies and crafts. Open from 8am to 8pm daily. Leave your children in the expert hands of the resort’s fully-trained staff while you enjoy a break. Available upon request. Complimentary guest passes to Wild Wadi Waterpark - family days out don’t get much better than a complimentary trip to Wild Wadi Waterpark™.